Are you ready for a spooky Silent Cinema experience where no one can hear you scream?? 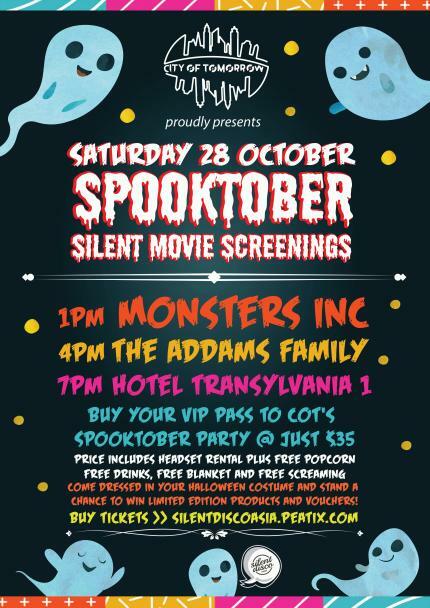 Included in the ticket price is Silent Disco Asia’s “Halloween” headset rental, “monsterous” movie screening (one session), “freakish” free popcorn, free “devilish” drinks as well as a comfy blanket to keep all the young sprites warm! Come dressed in your Halloween costumes, and stand a chance to walk away with limited edition COT products as well as vouchers! Limited to 50 places per screening. City of Tomorrow is a new concept store that aims to introduce the creative use of space for experiential shopping and events. With over 50 partnering brands, this City is designed with vivid landscapes of 7 different zones which includes The Queen’s Room, Secret Garden and The Locker Room among several other intriguing zones. Apparels, embellishments, footwear, skin care and many more are creatively situated in these curated areas of the City. Brands spread out across the intriguing zones in the City are presented in unique layouts offering consumers deeper insights into their philosophies, creatives and a story line to the various themes. There will be exciting and appealing fortnightly to monthly events and activities to provide something interesting each time consumers when they travel to the city walk by this intriguing space.